Providing you the best range of punjabi salwar kameez suits, printed salwar kameez, chanderi salwar kameez, fashion salwar kameez, cotton salwar kameez and churidar salwar kameez with effective & timely delivery. 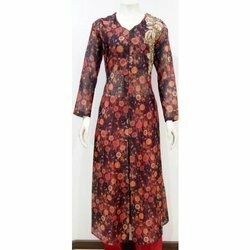 Printed Salwar Kameez offered come in exciting stitched finish and provides for superior wear appeal. 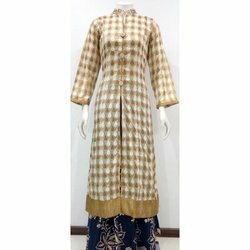 In order to meet the individual requirements of the clients, we offer an extensive array of Chanderi Salwar Kameez that is valued for high quality and smooth texture. Our entire product range is designer in nature and add special feminine look to the wearer. We offer them in exceptional prints and matching stylish dupatta is also offered. Our array offers Fashion Salwar Kameez that is perfect to be worn at formal occasions. 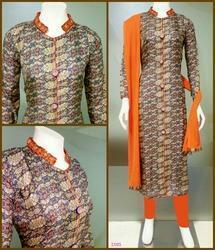 These kameez are intricately designed, and available in an extensive range of shades and patterns. 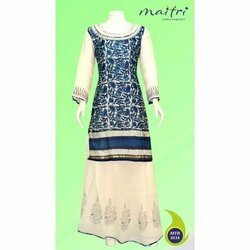 It is available with unique designed Dupatta. It defines outstanding style statement for the ladies who love to wear fashionable Indian cloths. Offering a wide array of Cotton Salwar Kameez, we are the prime manufacturers and suppliers in the nationwide markets. Cotton Salwar Kameez is made using quality fabric and thus, can easily be washed at home. The excellent color combinations, designs and fabulous patterns make these products hugely popular among clients. 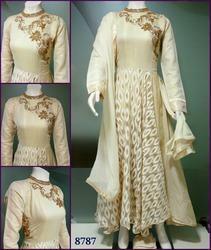 We manufacture these kameez using high grade raw material. Being the fashion conscious firm, we offer extremely designer collection of Churidar Salwar Kameez that is fabricated using quality assured fabric and advanced technologies. Our entire product range is formed with perfection and reflects the excellent work expertise of our designers. We offer them in standard fittings and can be customized with perfection. We present extensive range of ladies Designer Salwaar Kameez that is ideally designed for traditional and formal events due to their classical prints. Our salwar kameez is made up of excellent fabric that ensures long life and color fastness. Reflecting the richness of Indian culture, our range of salwar kameez is the true synonym of durability, beauty and fashion at the same time. Our range is created in a plethora of colors, cut and patterns. Our casual wear can be worn anywhere and on any occasion. Our casual salwar suits are the perfect dress for going to temples, evening wear, while working at home or office. They feel very comfortable and also make sure wearer looks very fashionable, beautiful & stylish. They add style to daily life. Our range of casual salwar kameez is free size, and with their flowing lines, is wonderfully flattering for the fuller figure. Women of all sizes can wear these outfits with confidence. Looking for Designer Salwar Kameez ?